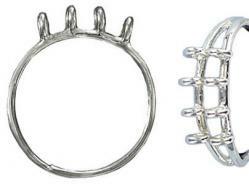 Sterling silver finger ring with 8 loops .925, size 6 1/4 and up. Frabels Inc.
Sterling silver finger ring with 8 loops .925, size 6 1/4 and up. (SKU# FR8209/SSWH). Sold individually.